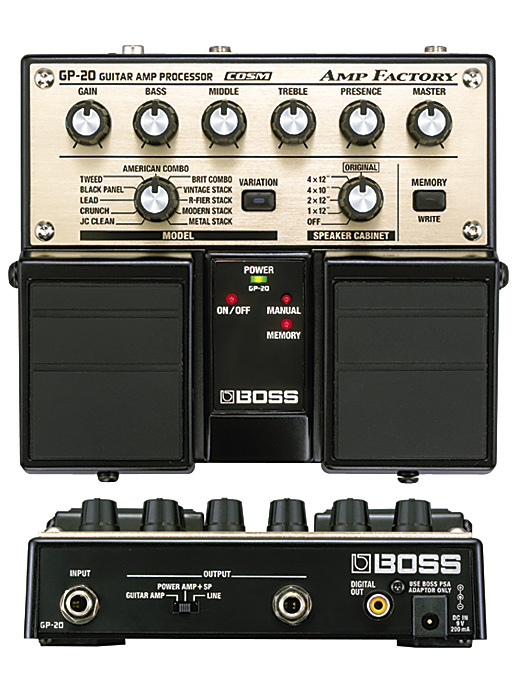 "The BOSS GP-20 Amp Factory pedal starts where overdrive and distortion pedals leave off, giving guitarists 22 COSM Guitar Amp models and five speaker cabinet simulations optimized for providing great live tones. ... simple knob-based controls-Gain, Bass, Mid, Treble, Presence and Master, plus knobs for Amp Model and Speaker Cabinet selection... quickly dial in to a variety of classic and modern amp sounds with minimum hassle. ... fully programmable ... selectable output for connection to a standard guitar amp, or direct connection to power amps, mixers and recorders. For recording applications, ... digital output." The GP-20 Amp Factory offers a variety of ...COSM Guitar Amp models designed for live performance or recording - 22 in all. ... two-channel operation, and ability to model the best amps ever made, the brilliant GP-20 is ... for live or studio applications.